The first gene therapy for cancer, approved by the Food Drug Administration in August, will transform the treatment of a particular kind of cancer in children and young adults. It's transformative because it uses a patient's own immune cells to attack the cancer cells. The hope is that this is just the first of many other drugs capable of harnessing a patient's immune system. However, this therapy, called Kymriah (tisagenlecleucel), and similar ones in the pipeline raise difficult challenges for policy-makers. "Safety, access and cost-we have to figure all that out if everyone is going to benefit," says Karen Maschke, the first author. Maschke, Michael Gusmano, and Hastings Center president Mildred Solomon describe the breakthrough, evaluate the challenges, and make recommendations in the October issue of Health Affairs. The new therapy was developed by Novartis to treat children and young adults with relapsed or refractory B-cell precursor acute lymphoblastic leukemia (ALL). Called chimeric antigen receptor (CAR) T cell treatment, it works by genetically reengineering a patient's T cells, white blood cells in the immune system. 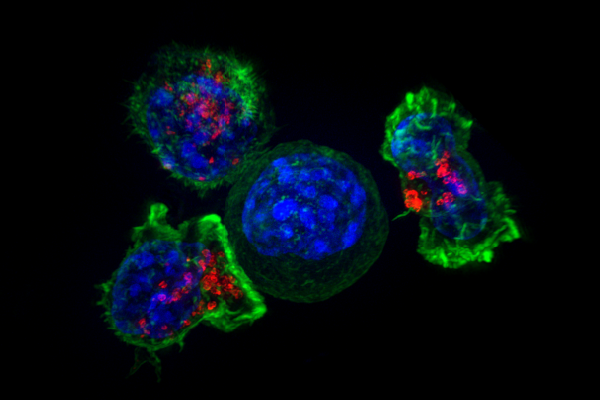 The altered T cells are then infused into the patient to attack the cancer cells. Clinical trials by Novartis found that 52 out of 63 patients were in remission three months after receiving a one-time infusion. However, the therapy also has life-threatening neurological and other side effects experienced by 76 percent of patients, and it increases the risk of patients developing secondary cancers. The authors point out that as CAR T cell cancer treatments continue to be tested in clinical trials before obtaining FDA approval, "the FDA and Institutional Review Boards (IRBs) with oversight over human subjects research must carefully scrutinize [the risk benefit profile] to determine whether the potential benefits of the investigational treatment justifies permitting cancer patients to enroll in a study." They also recommend that IRBs make sure that all consent forms clearly state the possibility of adverse effects and that the FDA conduct post-licensing monitoring of adverse events that patients experience. The agency is requiring Novartis to conduct a postmarketing study of the safety and efficacy of Kymriah. "However, it is an open question whether the FDA, under the administration of President Donald Trump, will withdraw licensing approval from breakthrough therapy products whose clinical use over time indicates that they are ineffective or harmful to patients," they write. The authors raise concerns that many patients who could benefit from the therapy will not have access to it-at least not for a while. That is because the highly specialized skill needed to genetically reengineer the patients' T cells, administer the infusion, and treat the serious side effects are in short supply. Kymriah will be available at certified treatment centers in only 16 states, all but four with just one treatment site. "Having fewer sites with highly trained clinical staff treating very sick patients is often optimal for ensuring high-quality delivery of complex treatments, but at least at first there will be a serious access challenge," they write. "Even if the problem of limited availability can be solved, the cost of treatment still raises important questions of justice," the article explains. Kymriah will cost $475,000 for a one-time infusion, and FDA approval of a therapy does not guarantee that insurers will cover it. "If CAR T cell therapies prove as safe and effective as other recent breakthrough treatments, the benefits will be tremendous, and demand will be high," the authors write. "However as has been the case with other recent beneficial but high-price drugs, CAR T cell therapies may lead to higher health care costs, highly limited access, and even greater inequalities in access and health outcomes. For the public to benefit from breakthrough treatments without breaking Americans' health care system or pocketbooks, ethics and wise policy making need to catch up to the science."